The meeting reportedly took place on 10 April and included some of the most influential people behind President Trump’s Venezuela policy. In addition, there were several senior officials from the Colombian and Brazilian embassies as well as representatives of US-backed Venezuelan opposition leader Juan Guaido, who declared himself interim president earlier in January. Radio Sputnik's Johanna Ross asked Francisco Dominguez, from the Venezuela Solidarity Campaign, to share his view on this secret meeting. Sputnik: Is this secret meeting a sign that the US has run out of other options and is, in fact, weighing up military intervention? Francisco Dominguez: I think there is, I think the powerful and influential the structures of the US government establishment — which include the military, the Congress, the Senate, the government — are really thinking about this, seriously, and the reason is they have tried absolutely everything including one of the unprecedented attacks on the electricity system of Venezuela and nothing seems to work. And the US said yesterday they have started buying again Venezuelan oil because they have run out of it. The boycott, the blockade, it's working against the US and Venezuela is re-organising itself in order to sell elsewhere. So it seems to be it's a serious, serious consideration by very important people who are very influential. 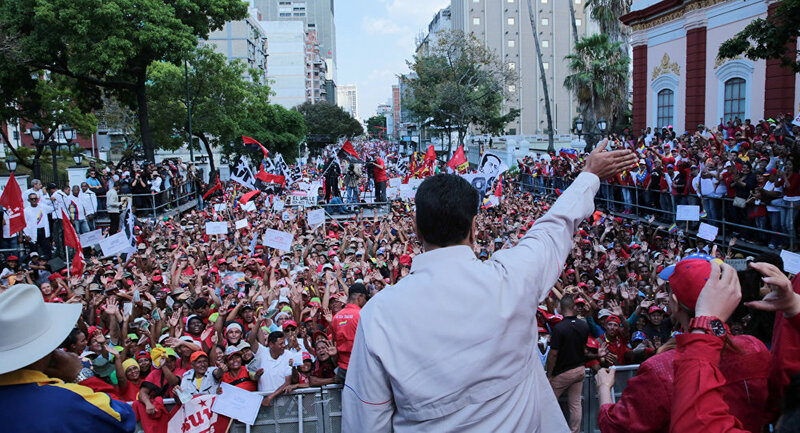 READ MORE: Moscow Slams Pompeo's Claims About Russia's "Intervention in Venezuela"
Sputnik: Max Blumenthal has said that some of the figures who are mentioned have played key roles in the past in destabilising Venezuela – would you agree with that? Francisco Dominguez: Yes, just looking at the list, there are no surprises, Colombia is there, the international republican institute is there, USAID is there, obviously the Venezuelan right-wing that now claim to be in the Venezuelan embassy are there so there is no surprise in that. What is surprising to me though is that all these think-tanks which on many occasions present themselves as being in favour of democracy and human rights and so on, such as Michael Shifter from Inter-American dialogue — are part of this. This is quite significant. And I wonder if there were calls to discuss their views regarding the pros and cons of the possible military attack or whether they are willing participants in creating a commission for such an attack. This is extremely embarrassing for them. Sputnik: What would the US set out to gain by conducting a regime change operation in Venezuela? Francisco Dominguez: I think they thought that after Chavez had gone, they thought they had excellent conditions for you know, 'getting it' — for withdrawing the government of Venezuela — which it had been trying to do since 1999. They launched an economic war immediately after that and they have tried everything ever since. Nothing worked. And they are trying now the interim self-proclamation of a new kind of president — which actually hasn't worked. Even though at the beginning many countries recognised Guaido, now they are withdrawing from it. So after the possible attempt to push through by military means humanitarian aid through the border which failed miserably, and then this cyber attack on the electricity system of Venezuela, I think they realised that unless they do something quite dramatic they are not going to be able to do what they want which is overthrow the government of Venezuela. And time in this sense, is on the side of Nicolas Maduro. The views and opinions expressed in this article are those of Francisco Dominguez and do not necessarily reflect those of Sputnik.